Honor is misunderstood in the social sciences. The literature lacks both accuracy and precision in its conceptual development such that we no longer say what we mean because we have no idea what we’re saying. We use many terms to mean honor and mean many different ideas when we refer to honor. Honor: A Phenomenology is designed to fix all of these problems. 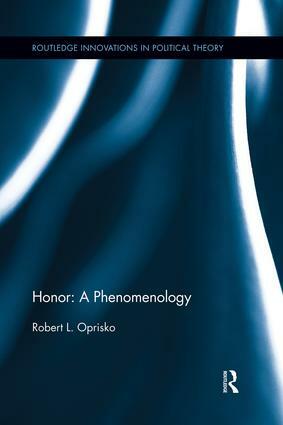 A ground-breaking examination of honor as a metaphenomenon, this book incorporates various structures of social control including prestige, face, shame and affiliated honor and the rejection of said structures by dignified individuals and groups. It shows honor to be a concept that encompasses a number of processes that operate together in order to structure society. Honor is how we are inscribed with social value by others and the means by which we inscribe others with social honor. Because it is the means by which individuals fit in and function with society, the main divisions internal (within the psyche of the individual and external (within the norms and institutions of society). Honor is the glue that holds groups together and the wedge that forces them apart; it defines who is us and who them. It accounts for the continuity and change in socio-political systems. Robert L. Oprisko is a Visiting Assistant Professor of International Studies at Butler University in Indianapolis, IN. He graduated from Purdue University in 2011. His dissertation, The Phenomenology of Honor, has been nominated for the Leo Strauss Award and the APSA Best Dissertation Award for Political Psychology.